So, this must be that winter thingy, which I’ve heard so much about—sub-zero temperatures, snow, sleet, hail, gales, ice and hordes of emaciated Frenchmen stumbling through the drifts, harried by wolves and Cossacks as they make their desperate retreat from Moscow. This week the winds reached 70 miles per hour, and it says a lot about the year so far that this came as something of a relief after the 90-mile winds of last Friday. It’s rather disconcerting to look up and see a seagull drifting sedately backwards past the window, as though God had just pressed “rewind” on his remote control because he wanted to watch the last few seconds over again. It was not without its compensations, though. I walked to work last Friday down by the river, just as a mini-blizzard struck. 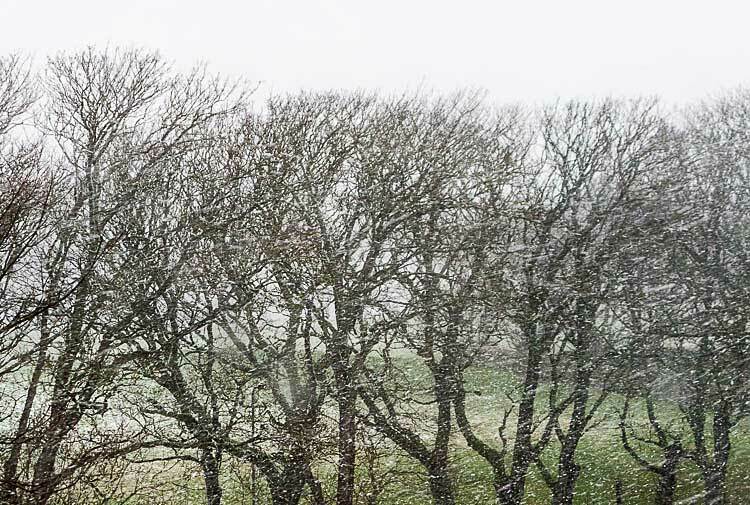 The sun rises around 8.45am this time of year, but the clouds came over so thickly that everything was still dark, in a sort of eerie grey twilight: the wind got up, coming from behind me, and then it began to snow. Soon the wind was whipping the snow past me horizontally. Then I caught a sudden movement on the river and when I turned my head I saw a black bird like a heron flying past, beating into the wind and snow like a Chinese print come to life, before it disappeared again into the darkness. My daily commute, I thought. 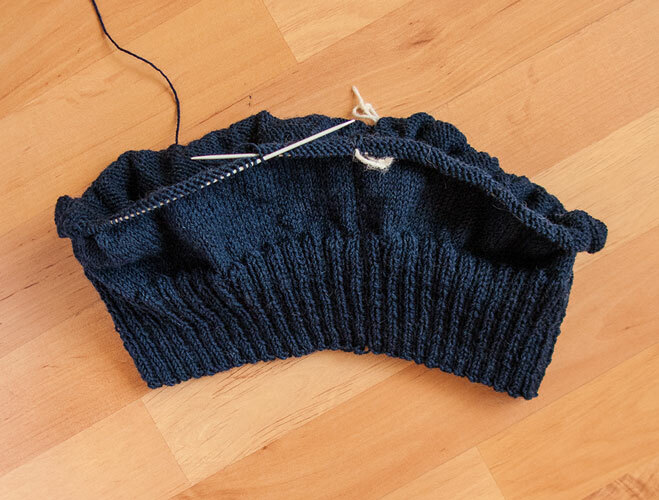 In gansey news, my fingers seem to have rediscovered how to knit with 2.25mm needles and yarn that requires an electron microscope to see, and as a result I’m past the ribbing and on to the body, which will be knit plain up to the yoke. As I said before, I plan to donate the gansey to Wick Museum, as the pattern will be another Wick pattern. It’s taken from the same photograph in Michael Pearson’s book, Fisher-Gansey Patterns of Scotland and the Scottish Fleet as the previous Wick pattern, the one on page 29. I’ll chart it out when I actually start the yoke. Meanwhile, I cast on 268 stitches and have now increased to 296. I thought I’d aim for a 40-inch chest size, but since it’s going to be given to the museum I don’t have to be too exact, for once! 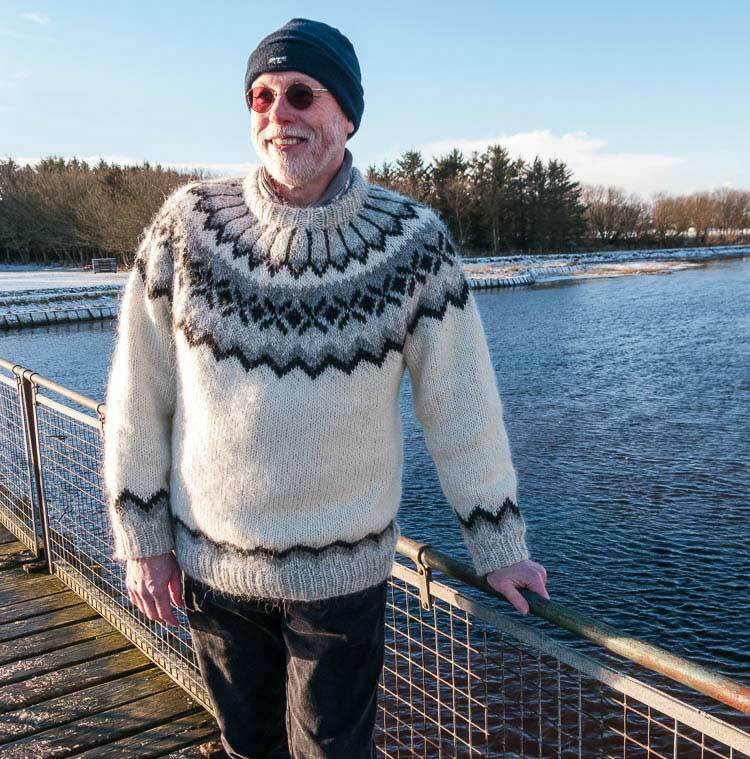 Finally, by popular demand, we’ve included a picture of me modelling the Lopi sweater down by the river. As this took place in a piercing wind straight from the Arctic Circle I am now in a position to confirm that a Lopi is about as wind-resistant as a string vest; several passers-by assumed it was a desperate suicide attempt when I took my coat off and rushed to help but I told them I was practicing the new sport of extreme ornithology, in which you combine birdwatching with hypothermia, (which now I come to think of it is something of a tautology in a Caithness winter). I think metabolism must have something to do with it. I used to know a woman who swore that a lacy mohair sweater was all she needed for warmth when skiing, though she wore ordinary jackets when standing still. I didn’t believe her at the time, either. I must admit, my Lopi hats are slightly fulled and still let some wind through. I intend to try knitting them larger and fulling them more firmly. Oddly, the method doesn’t involve using more stitches so much as it involves using larger needles. Apparently fulling mostly happens lengthwise of the yarn, and bigger stitches allow the yarn more room to shrink. What’s on with that, I wonder. My other plan is to knit two layers and sandwich some ripstop nylon between them. I was being (slightly) facetious in my comment – I know, it’s not like me, is it? I was standing in a 30-mph wind in about -2ºC on an exposed bridge, so I don’t think any jumper would have stood up to that! Margaret had my coat round her shoulders and after two quick photos I was back in it like a ferret down a trouser leg. The interesting thing about the Lopi jumpers is that they seem to relax after a few wears, so they get slightly looser and baggier (and more comfortable), so I’m not complaining! Hi Gordon- or a leather jacket over. Lopi is a lovely insulating layer. It’s nice to see you wear the garment as on the blocking tiles it could be child size. Minneapolis is having a January thaw and the snow is melting. The other shoe does drop, we’re not done yet. The Lopi looks great on – really shows the beautiful yoke pattern at its best. Your weather reports bring fond memories of living in Fife where the weather is much less extreme. We are now in the relative warmth of Lincolnshire although I think the wind tries to outdo its northern cousin on occasion. Yes, but at what cost? Take a close look at the colour of my hands—it’s like a medical dictionary illustration of frostbite I tell you! Looks great on! It sets my fingers itching to get another Lopi on the needles. My Dad is still in hospital after having a very bad fall at my cousin’s on the 30 Dec just prior to a big New Year family gathering in Derbyshire. We haven’t yet had the heart to tell him that the paramedics who came out to the house cut off his favourite Lopi sweater at the time. He has no memory of the fall itself so I am hoping that if I can get the replacement knitted in time for him coming out of hospital then it will take the sting out of the news! The yoke work on the Lopi is very impressive, nice colours and fit, a good change. Could it be possible that as the Lopi is worn and then washed, the yarn will come together a bit more and become more weatherproof? The new gansey is comIng on nicely too, you must be pleased with it. The museum are very lucky! Down in the South we have no snow, but plenty of ice, and later melted ice and mud, plenty of mud. The cold is positively stinging, but nothing like the cold further north. Stay warm! The Lopi jumper is such a comfy warm garment indoors that it can be as draughty as it likes outside! It’s like sitting underneath a friendly, clean-smelling pet sheep, like Mary’s little lamb’s mamma (baa! humbug!). Stay warm yourself, and as mud-free as possible! I love your Lopi sweater Gordon, it looks terrific on you. Lopi & an umbrella would be perfect for most of the year here in Vancouver, B.C. While we do get Arctic Express deep freezes occasionally, mostly it rains & stays above 0 – it’s 12C right now at almost midnight. I do believe our skiing community were really into Lopi in the 60s & 70s when that yarn was 100% wool but worn ‘apres ski’ with stretch pants & furry boots in front of huge fireplaces with a drink in hand. I think you’ll have to wear Ganseys in the winter & keep your Lopi for the summer. They both suit you very well. Thank you! Umbrellas are no use here in Wick, alas, for the wind snatches them out of your hand, sneers at them contemptuously and then twists them into shapes of the kind usually seen in modern art museums or nuclear test sites, before returning them with an ironic bow and then, almost as an afterthought, knocking you flat. I don’t have any stretch pants, except in the sense that any trousers I adorn my waist with seem to tauten like a rubber band under tension and restrict my movement to that of a major trauma victim lashed to a stretcher, but I am the proud owner of a pair of fluffy slippers that are like wearing a pair of very cute hollowed-out baby koalas on your feet—there but for a fireplace and large drink go I!